The Short Version: For nearly two decades, BootsnAll has been helping adventurers plan and execute complex travel around the globe. Operating on a philosophy that journeys are a vital and rewarding part of life, the organization provides DIY articles and destination guides to teach people how to map out long-term excursions, including gap-year, sabbatical, and ’round the world (RTW) trips. BootsnAll knows going abroad is all about opportunities to make connections with individuals and their cultures, and its resources and vast community of globetrotters offer seasoned voyagers and those new to the travel game what they need to become citizens of the world. A week-long vacation at Disney World or a relaxing few days on a tropical beach may sound like the dream vacation for some people. But, for others, stuffing a backpack full of bare necessities for a trek around the globe is as important to their lives as breathing. Jennifer Miller falls into the latter category. For her, travel was the key to reinventing her life. Jennifer and her husband did what many view as the unthinkable; they gave up the norm for the transformative power of travel. They planned, had difficult conversations, and confronted their personal fears. But, according to Jennifer, their two-year bicycle trip around Europe and North Africa was well worth it. To do what Jennifer and her husband did requires two things. First, you have to realize the pain of not living your dream is greater than the comfort of your more conventional life. And, second, you have to acquire the knowledge to plan and execute your trip effortlessly. The first is entirely up to you; however, a community of like-minded adventurers is waiting to assist you with the second part. BootsnAll provides a storehouse of resources to match adventure seekers with dream destinations. For nearly 20 years, BootsnAll has been providing travelers resources to plan and carry out complex excursions across the globe. Since its inception, the site has helped more than 4 million people bring their long-term travel dreams to life. BootsnAll understands travel is a way to make connections with new people and the cultures they inhabit. 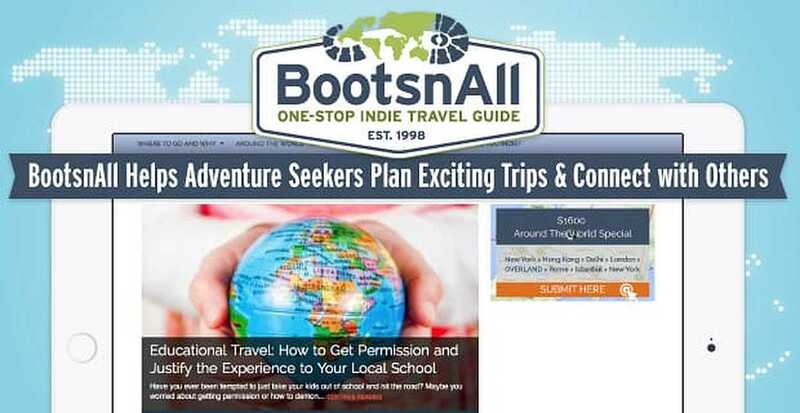 And, through its destination guides, information on the different styles of travel, and a large network of globetrotters, BootsnAll has everything you need to make a break from the everyday and see what’s waiting for you in the world. The philosophy behind BootsnAll is a simple one: long-term, independent travel is key to a complete education. Sean Keener, Co-Founder and CEO of BootsnAll explained his vision to us. BootsnAll presents travelers with destinations that will enrich their lives. This type of travel isn’t about hitting the tourist locations and checking items off a bucket list. These long treks are meant to open your eyes to the world around you. BootsnAll’s Sean Keene told us how the site has helped millions of travelers plan long-term trips. Global, long-term travel empowers you to learn more about other cultures and consider humanity with a new perspective. BootsnAll helps people realize this by offering tons of resources, tips, and articles about travel, as well as the resources to actually book their itineraries. Sean also discussed some of the hidden benefits of significant travel experience when it comes to attracting and keeping partners. It’s often said that travel is fun, but the planning isn’t. With BootsnAll, this isn’t the case. The site offers multiple resources — from booking sites to checklists and travel guides — to help make planning easy and cohesive. BootsnAll has taken the frustration and guess work out of mapping out long-term trips. Some travel sites make booking around-the-world travel confusing and difficult. But BootsnAll gives its users access to Indie, the only airfare engine to plan for trips with anywhere between six to 25 stops. Indie’s easy to use and provides the perfect blend of simplicity and function. The platform presents multiple booking options, offering both flexibility and the cheapest fares possible. BootsnAll also provides Master Checklists for planning your trip. Separate checklists are customized for individuals and families, so all your ducks stay neatly in a row. There’s even a list for those taking a career break, which includes consideration of places to visit and experiences to have that will enhance a résumé. Travel guides are an essential part of planning your long-term travel. For instance, maybe you want to visit Africa for the first time and are not sure what areas are best for travelers and what you shouldn’t miss. Clicking on the Africa section of the guides educates travelers on the pillars vital to the African experience. Information about transportation, tour companies, and accommodation options are also available. And, with the Africa Community Message Board, articles, and travel stories about Africa, BootsnAll is a one-stop shop for everything you need to know about visiting the continent. Everyone has dreamed of traveling around the world at some point in their lives. With RTW travel, those dreams become a manageable reality. RTW breaks down around-the-world travel into five major parts: Inspiration, Planning, While You’re Gone, Coming Home, and Travel Forums. Inspiration covers everything from travel myths to the best value locations for the US dollar. Planning covers all the FAQs and planning guides you might need so you know what to do. While You’re Gone gives critical insights on staying healthy on the road and how to manage work and volunteering while abroad. Coming Home deals with things not everyone thinks about like reverse culture shock. Finally, Travel Forums connects travelers for important discussions and question answering regarding around the world travel. BootsnAll also offers free 30-day courses to help travelers plan their RTW trip. Each day, you receive an email that walks you through all the details, such as planning, saving, and budgeting, that go into making your trip a reality. For instance, day three’s email might cover where to go and day seventeen’s focus could be on immunizations. Planning trips of this magnitude can be overwhelming, so the 30-day course is key to managing each part of the travel experience in daily doses. Sean belives going on an around-the-world trip is a unique experience that is important to everyone. Being a global citizen opens you up to learn more about the world and how to genuinely connect with and relate to others. BootsnAll wants to eliminate all obstacles to the learning experience of being a citizen of the world. In fact, Sean is doing a lot to help students and others attain this experience through his new endeavor, the Travel Access Project. World travel makes people more compassionate, informed, as well as better workers, teachers, and companions. Jennifer Miller realized there will always be naysayers to dissuade you from running off to see the world. And Sean wants people to marinate on this when looking for inspiration to travel.